The technique on today’s card using Shine Bright is similar to one I shared at a make-and-take at CHA2017 a few weeks ago. I’ve added quite a bit – the sky, primarily! I wasn’t sure it was going to work and am delighted to report that it did! Watch the video below or click HERE to see it in HD on YouTube. Great tutorial! You go into enough information to really help me see why you and selecting colors, brushes, etc. Thanks so much! Those didn’t look like Daniel smith watercolors. Does his come ina pan like that? I buy my tubes and put them in pans. 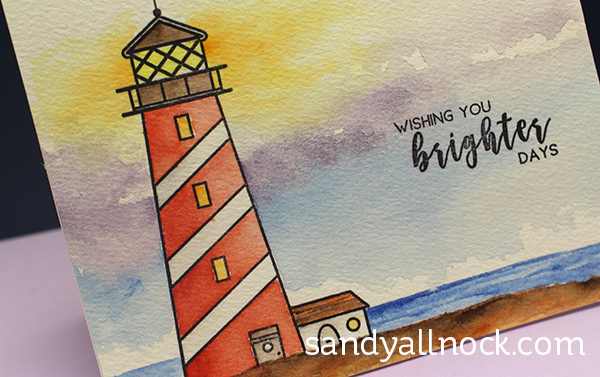 Beautifully coloured, serene and uplifting card! Thank you for your instruction videos. I do like the idea of “in case you missed it.” However, a couple of letters are switched; the acronym should read ICYMI. 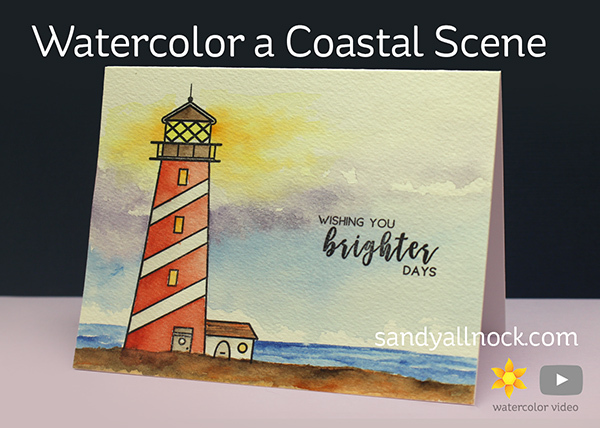 GORGEOUS watercolored card! Thanks for the video!